The topic of antibiotic and growth hormone use in livestock has been on our radar for a while. We first addressed the issue in our 2013 Meat Matters consumer research. In January 2014, we revisited the topic and surveyed 200 meat consumers to discover if their views and behaviors surrounding the use of antibiotics and growth hormones in livestock had changed. 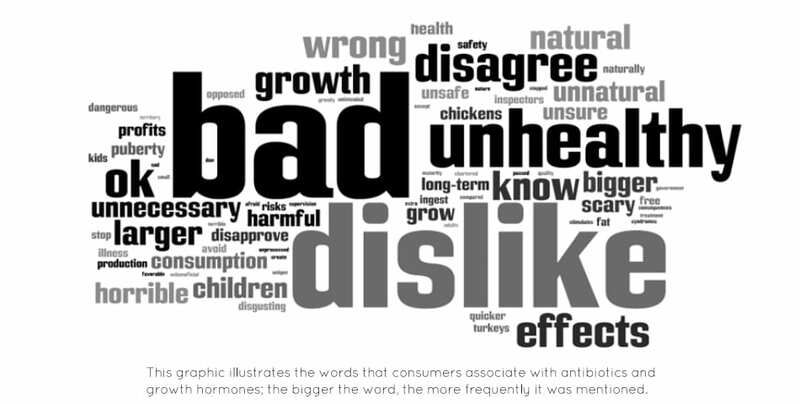 So what do today’s consumers think about the use of antibiotics in livestock? 88% of consumers are aware of antibiotic use in animals, and 60% are concerned about it. But our research also revealed that consumers don’t have all the facts; plenty of misconceptions and confusion surround the issue. As a result, what consumers don’t know about antibiotics affects how they think about and shop for meat. After hearing/reading about the use of antibiotics and growth hormones in livestock, 17% of respondents stopped buying meat where they thought antibiotics and/or growth hormones were used. Get more key takeaways that reveal the current consumer mindset on this important issue.